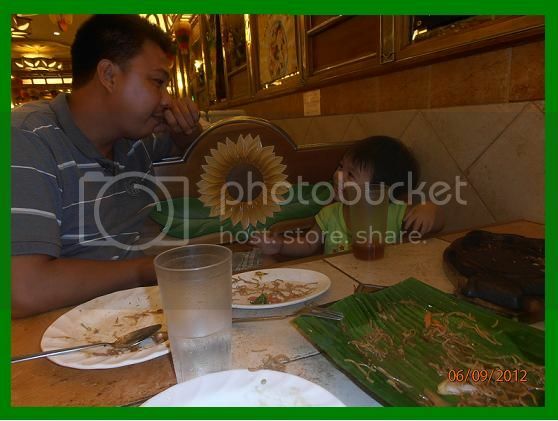 I just want to share our dinner time at Buddy’s Restaurant. 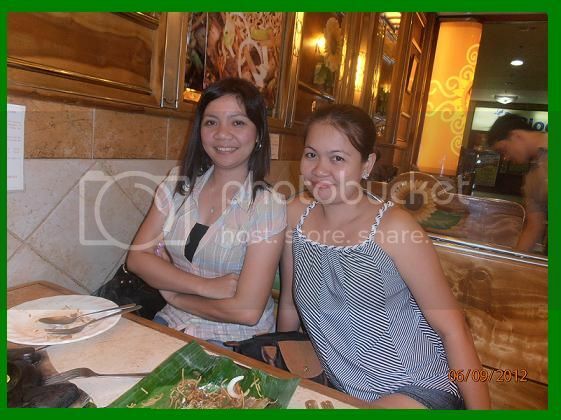 Buddy’s restaurants are very familiar to everyone they have a many branches here in Quezon province and the main branch is in the province of Lucban, Quezon. By the way the photo below is in the Buddy’s restaurant when my sister treats us for blow out dinner. She inviting us for dinner because she promoted to her job. I think its 8:00 o’ clock in the evening (late dinner hehe) she was very happy to ask me about her promotions and that’s good for her. Thank you sister for the dinner! Mwahhhh love you sis! May God bless you always and more power to your success! Balut eggs are very common to us, it is called duck embryo that is boiled and eaten in the shell. It is a common food in everyday life and anyone knows balut eggs are more calories, protein and fats. I am one of those people who eat balut egg except the fetus of duck inside. A ballot egg is from a duck contains a high protein and fat. Anyway, balut are mostly sold by street vendors. It is commonly sold as streetfood here in the Philippines. Like the photo below, every night around 7:00pm to 9:00pm the balut vendors sell her balut and chicharon baboy in our Subdivision. I took a photo during my neighbors eat balut with salt and vinegar. 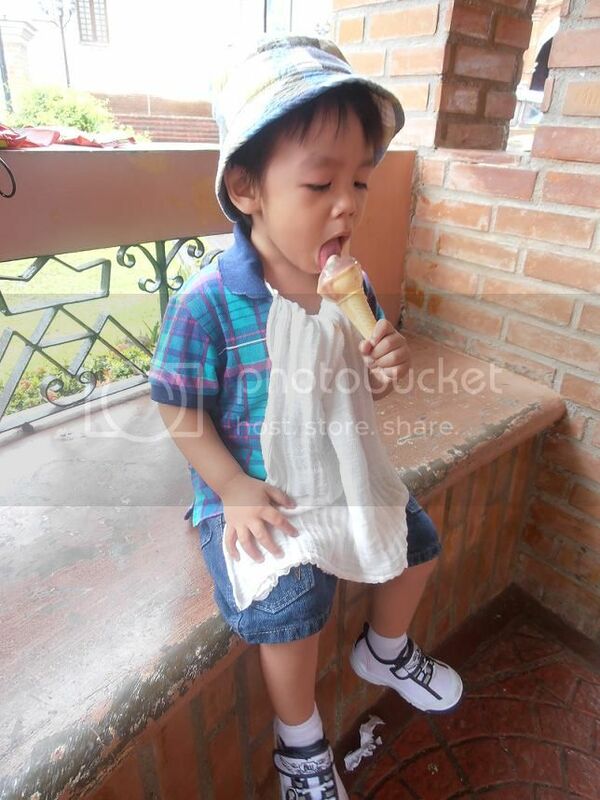 Another photo below when my nephew Vince goes outside the house after he eats balut. Yes, he loves to eat balut and everytime he heard balut vendors I bought one for him. I was really amazed because he eats a fetus of duck while I do not want to eat like that. Dirty ice cream or sorbetes is very familiar to us. In everyday my nephew Vince waiting the ice cream seller. When he heard rang of the bell, kling-kling it is a sign sound of an ice cream vendor. Vince makes it faster to ask me the money. Then I will give him P5.00 only for one cone. But sometimes I did not give him because I just take care himself to avoid the cough and cold. Dirty ice cream is cheap amount compared to the other branded ice cream. 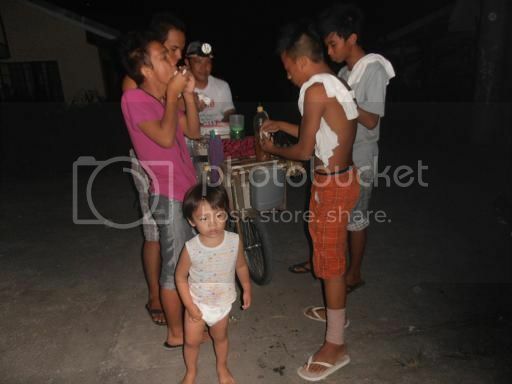 Just because of the P5.00 per cone many children can afford to buy the dirty ice cream. I took a photo when he ate the dirty ice cream. The place is in the Liliw Laguna, during my SIL and I bought the footwear for our small sideline income. Because Vince is two years old he needs to put the swaddling clothes or lampin instead of baby bibs during he eat of ice cream. He feels to eat the dirty ice cream and I say that ice cream is one of his favorite foods. orange fruits. The color is yellow and the shape is round if you open you can see the seeds inside. Granadillas shell is hard and shiny. The taste is like the orange juice and the smell is like a guava fruit. My neighbor was selling the granadilla’s juice, according to him granadilla’s juice is not familiar to everyone. Because it is a new product invented by one of his friends. I also interested because the taste is good and perfect for the cough and cold. Then I was search the internet about the granadilla’s fruit. I was not totally shocked when I saw the fruit hehe; because the fruit was very familiar to me is called mirenda in our hometown and ordinary fruit. I was happy for the new juice product of granadilla’s fruit because it is favorites of my hubby and my loving nephew. The one bottle of juice is cost of P45.00, very affordable price; the one bottle is exactly for one week to us. Because the juice is pure, I just take a little juice then I will add water and a little bit of sugar. Anyway, based on my research the granadillas is called the passion fruit. The fruit is rich for antioxidants, minerals, vitamins and fiber. Leche plan is a perfect dessert during wedding or any occasions. Yesterday has no occasions but I was surprised because my hubby makes a leche plan for me just because this is my favorite dessert. According to him he tried to make a leche plan, and this is the first time to make this. He search the online how to make a leche plan, according to my hubby making leche plan was very easy. Here are the ingredients, 10pcs of egg yolk, vanilla, 1 big can alaska condensed milk, and 1 small can alaska evaporated milk, then he started mixed. In a llanera, caramelize about 2 tbsps. of refined brown sugar over direct heat, moving the llanera around with a tong to prevent the sugar from burning. Watch this process because the sugar can burn in less than a minute if it stays in one place for too long. When the sugar has melted and has turned brown, remove from heat. Then prepare the steaming, this is the traditional method for cooking leche flan, and is usually prepared in an oval-shaped metal pans called Llanera and steamed over moderate heat until set. These ingredients are for three llanera only. Just very simple to prepared leche plan.